Nearly 5,000 miles separate what began as inspiration born among the pubs of the English countryside and what eventually became Vista Brewing, a destination craft brewery in the scenic Texas Hill Country southwest of Austin. After spending some time living abroad, Vista Brewing founders Kent and Karen Killough eventually brought their fondness for spending weekends exploring English countryside pubs back to Texas. Since Vista Brewing’s grand opening in 2018, the Killough’s family members, locals, and visitors can now explore the historic 21-acre property while creating their own special memories. Vista Brewing, complete with a well-preserved 1840s era dry-stacked limestone wall, sits in the center of the original 1830s land grant belonging to William Barret Travis, founding father of Texas. The property’s focal points are its 2,500 square-foot tasting room and 5,000 square-foot brewery built among more than 600 native oak and elm trees. 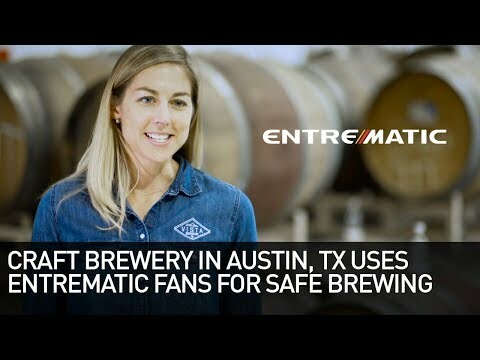 Create a comfortable and safe working environment inside a 5,000 square-foot brewing facility located where outside summer temperatures often exceed 100 degrees F.
Two Entrematic I-Class™ 12-foot diameter industrial HVLS fans operated via Entrematic’s digital touch-screen remote. Strong, even airflow that keeps working conditions optimal during hot and humid summers as well as floors dry in an environment where persistent floor moisture is a serious safety concern. Watch the Vista Brewing Customer Story. While the tasting room provides visitors with plenty of air conditioning, the craft beer brewery offers no such luxury. And with the region experiencing more than 100 days each year in excess of 100° F along with high humidity, the brewery required a solution to move large amounts of air. The Killough’s top priorities were to keep employee working conditions comfortable and safe. Ongoing safety is a constant concern due to the brewery’s floor areas frequently becoming wet during various beer brewing processes and activities. Working with local architecture firm OPA Design Studio (which specializes in brewery design) and during a visit to the Craft Brewers Conference, Vista Brewing discovered just the right solution for proper airflow. While attending the conference, the Killough’s met with Entrematic’s sales team to learn more about the company’s I-Class™ industrial HVLS fans. “Entrematic’s representatives were very responsive in helping us fine tune and determine the correct size of fan we needed in our space and how much air we needed to move,” pointed out Karen Killough. Josh Watterson, Vista Brewing’s brewmaster, is responsible for all products and actions that happen inside the brewery. The facility uses a variety of steam-powered equipment, and with two different steam vessels operating, the brewery can get very muggy, hot and uncomfortable. Watterson explained that if the air inside the brewery wasn’t moving, the combination of high temperature and humidity could create a dangerous working environment and contribute to potential accidents. Watterson added that with the fans running, the brewery’s evaporation process occurs much faster. In addition, any water that does accumulate on the brewery floor dries up quickly due to the amount of moving air. With no air movement and the brewery’s high humidity levels, that same water would take very long to evaporate because of the moisture-saturated air. “When draining and cleaning tanks, as well as using water for different aspects of the brewing process, we need that water to evaporate from various surfaces for both safety and cleanliness,” Watterson explained. All of Vista Brewing’s beers are made with water sourced directly from the property’s limestone-filtered water well. After the fans were installed, and to help keep the brewery warm during the winter, Vista Brewing suspended several electric radiant heaters from the brewery’s ceiling. Killough said she’s looking forward to how the fans will help distribute the heated air throughout the brewery and is anticipating that the circulated air will help keep heating energy costs to a minimum. During Vista Brewing’s construction planning phase, Killough said they were familiar with large industrial HVLS fans. She and her husband realized early on that they’d need that type of solution to move air in the unairconditioned brewery in order to create a livable working environment. At the same time, they also had to carefully plan the brewery’s layout and consider how the fans would integrate into the brewery’s overall operation. • Paying special attention to height placement due to the vertical nature of various equipment in the brewery. • Installing the fans so they wouldn’t interfere with retractable electric cord reels. • Considering future expansion plans that could potentially double or triple the capacity of Vista Brewing’s 10-foot-tall fermentation tanks and associated mechanical piping systems. • Placing the fans over the areas that get wet most often so they keep employees involved in cleaning and packaging safe. • Accommodating a sloped ceiling on one side of the brewery which required installing the fan at that location using an extension pole (the architect and contractor worked together to ensure the extension was the correct length for the ceiling angle). “Visitors during brewery tours are constantly commenting about the fans, how big they are and how much air they’re moving,” Killough said.